Professional cell phone information extraction software fetches useful mobile phone information including mobile IMEI number, sim card IMSI number, manufacturer name, address book contact, phonebook capacity status for both sim card and phone memory. 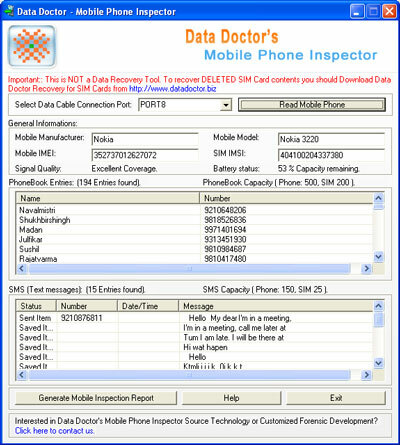 Mobile phone analyzer utility provides detailed information about text SMS including message status with sender phone number and contents. Application supports all leading mobile phone brands. Qweas is providing links to Mobile Phone Analyzer 2.0.1.5 as a courtesy, and makes no representations regarding Mobile Phone Analyzer or any other applications or any information related thereto. Any questions, complaints or claims regarding this application Mobile Phone Analyzer 2.0.1.5 must be directed to the appropriate software vendor. You may click the publisher link of Mobile Phone Analyzer on the top of this page to get more details about the vendor.